Will you subscribe to the Tantra mantra? 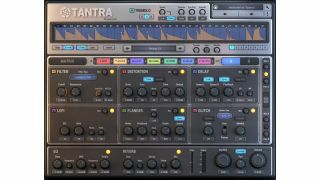 Dmitry Sches, developer of the rather fabulous Diversion synth, has returned with a rhythmic multi-effect plugin known as Tantra. This is designed to turn any sound you care to choose into a complex rhythmic progression with plenty of movement. Sitting at the heart of Tantra are eight multimode modulators that can generate rhythmic 32-step multi-stage envelopes with adjustable shape and different operating modes. Responding to these modulations are six effect processing modules: Filter, Distortion, Delay, Lofi, Flanger and Glitch. Each effect has two independent layers, enabling you to produce audio rhythms consisting of two sub patterns. Tantra is available now from the Dmitry Sches website in VST/AU formats for PC and Mac. The full price is $69, though it's currently available for $49, and there's also a demo for you to try.